Johnson was the first President to be impeached, although he was not convicted. His view were considered moderate regarding the South. He vetoed laws which would have restored military rule over the south, as well as the bill that gave Negroes citizenship. 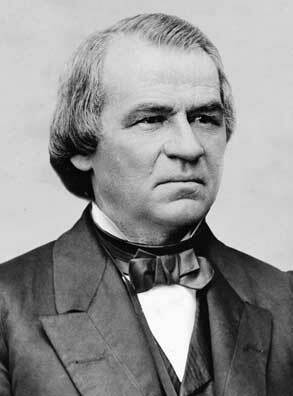 Andrew Johnson was born in a log cabin in Casso's Inn in Raleigh, North Carolina. When Johnson was three, his father died, leaving the family in poverty. When Johnson was 14, his mother arranged an apprenticeship with a tailor. As such, he and his brother were forced to work in exchange for room and board and lessons in the trade. After two years, Johnson and his brother ran away. After hiding in Carthage for a year, Johnson moved with his family to Greenville where he opened his own tailor shop. In 1827, at the age of 18, Johnson married Eliza McCardle. He had received no formal education but was taught to read and write by Eliza. Johnson's tailor business flourished. From 1828-30, Johnson served as a town alderman. From 1830-33, he was mayor of Greenville. From 1935-1837, and then again from 1839-41, he served as a member of the Tennessee of House of Representatives. From 1841-43 he was in the State Senate. For the next ten years, Johnson served in the US House of Representatives. Johnson was a strong supporter of federal power, a Jacksonian democrat. He was a strong supporter of the Homestead Act, which gave landless citizens access to government lands at no cost. From 1853-1857 Johnson served as Governor of Tennessee. In 1857 he was elected to the US Senate. As the Civil War loomed, he remained the only Southern Senator to denounce secession. In December 1860, he stated: "Though I fought against Lincoln I love my country. I love the constitution and swear that it and the Union will be saved as Old Hickory Jackson did in 1832. Senators, my blood, my existence I would give to save this Union. " In the South, Johnson was viewed as a traitor. In the North, his stature grew to heroic proportions. From 1862-1864, Johnson served as the military governor of Tennessee. He insured that the State remained under Federal control. In June of 1864 Lincoln prevailed on the delegates to the Republican convention to nominate Johnson for the role of Vice President. Johnson's Presidency was dominated by the attempt to reintegrate the South into the Union. Johnson's basic policy was a continuation of Lincoln's: the South would quickly be readmitted with no retribution. Simultaneously, Johnson urged that the rights of the newly freed slaves be protected. Unfortunately, this was not to be. Many Southern States imposed laws restricting the rights of newly freed slaves. At the same time, leading Northern politicians demanded Southern retribution. Congress then passed a long series of acts that brought about direct federal control over much of the North, empowered the local blacks, and imposed certain restrictive measures on many local whites. Johnson fought many of these acts. He exercised 29 vetoes, 15 of which were overridden. In 1868, the House of Representatives brought articles of impeachment against the President. He was charged with violating the Tenure of Office Bill, which did not allow him to remove any individual from office without the consent of the Senate. Johnson succeeded in defeating the bill by one vote. During his term in office, the Thirteenth and Fourteenth Amendments to the Constitution were passed. In addition, Alaska was purchased from Russia for $7.2 million. Married at a younger age than any other President. First President with neither a military or legal background.